People living with dementia should have access to a wide range of carefully considered individual and group activities, with plenty of opportunity to socialise with others. By focussing on a person’s likes, dislikes and what makes them happy you can plan activities that they will enjoy and find stimulating. It could be that the person used to dance when they were younger, so taking them to a dance show or competition could be most entertaining, or perhaps they used to work as a chef and would enjoy a trip to a favourite restaurant. It’s important to make sure that the activity is something that the person can be active in so they won’t be made to feel like they can no longer take part in a favourite pastime. At Anchor, we work with our customers to create something called a Life Story. Creating a Life Story involves recording relevant aspects of a person’s past with the aim of using this information to benefit them in their present situation. Developing Life Stories for people living with dementia enables the people caring from them to understand more about their personality, feelings, loved ones, experiences and future aspirations. 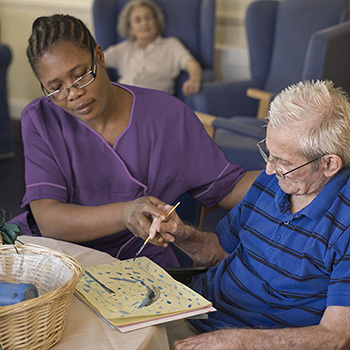 Find out more about how we support people living with dementia in our care homes.